For those of you reading this blog who have ever asked the question, “Hey, I wonder if I can use the A1C to screen my patient for diabetes,” like Cinderella, your dreams may have just come true! However, before you use the A1C tests in mass screenings like you do for performing a pre-op chest x-ray on a patient going for a face lift, you best read the fine print. I’ll start with the basics and then make things a lot easier to understand from there. First, what is an A1C? The A1C assay is globally accepted as the most reliable means of assessing chronic glycemia. Long-term diabetes related complications have been noted to occur with increasing frequency when the A1C exceeds 6.5% according to many observational landmark trials (DCCT and UKPDS). Diabetes treatment is often adjusted based on the percentage of hemoglobin which is glycated. The more glucose circulating within the plasma, the more likely the hemoglobin will become “stuck” to the glucose and the higher will become one’s A1C. (Glucose can also stick to proteins and albumin producing painful advanced glycosylated end products or “AGEs” which cause neuropathy). Although the A1C reflects ambient glucose levels over the past 90-120 days (because the life cycle of hemoglobin is 90-120 days), in reality, 50% of the total A1C is indicative of plasma glucose values over the past 30 days. Therefore, if a patient knows that they will be seeing the doctor in 1 month and they understand the true nature of A1C testing, they could essentially “cram for their visit,” be perfect angels for 30 days and score a near outstanding A1C in time for their office visit. Not too many people take the time to cram for their visits and lower their A1Cs from 8% to 6.5%, but one could see that using an A1C as a screening tool might not be an ideal way to diagnose all patients with early diabetes. More on that later. The vast majority of A1C assays have been standardized worldwide using the National Glycohemoglobin Standardization Program, the same assay used in the Diabetes Control and Complications Trial (DCCT) which established the relationship between A1C levels and risk for developing long term complications. A new and improved standardized A1C assay has been developed by a group of chemists (also known as extremely smart dudes with time on their hands to undertake such an assignment). This assay is NOT intended for routine laboratory use, because, like the atomic clock, the assay is near perfect! Unfortunately, the chemists realized that if everyone with diabetes had a repeat A1C performed using their technique, the A1Cs would be reported as being 1.5-2 percentage points LOWER than the currently used assays. Thus, a poorly controlled patient with an A1C of 8.5% would be told, “great job, Joe, your NEW A1C is 6.5%. You must have a great doctor. 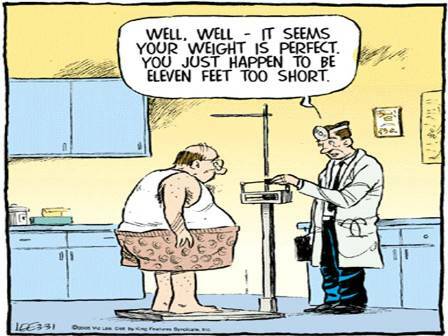 You’ve never looked better.” To make matters even worse, the NEW A1C would not even be reported as a %. Joe’s lab value would actually be read as 6.5 millimoles per mole! Oh, that’s great. Just when I thought I understood what a TZD was, they changed the units on the A1C. So this group of chemists got together one day at the local pub, played some darts, talked some trash about the Raiders and, most importantly, figured out a compromise on how to integrate the new and improved A1C report into clinical practice. Rather than reporting the result in unrecognizable units, they decided to continue to use a percentage of glycation AND also report an estimated average glucose value (eAG) for each result. For those of you interested in calculating your own average glucose values, feel free to refer to figure 1. 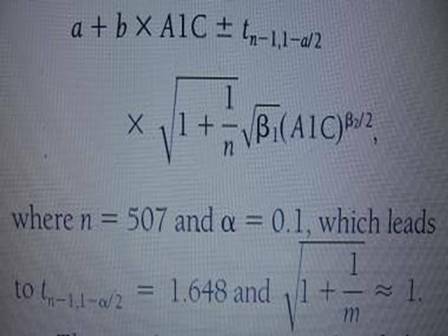 This is the formula these geeks used to make these calculations using the “Bayesian method.” I hope I have re-invigorated your memories of 9th grade calculus. All I can tell you at this time is, if you can come up with a better way to calculate an average glucose value, have at it, but don’t ask me for help! Note: The coding for the letters was not included because I did not feel they were important. However, I did check out the validity of this formula and found it to be right on target. In fact, I also used the formula to calculate my estimated 2009 quarterly taxes. The estimated average glucose (eAG) are closely related to the A1C for patients with type 1 and type 2 diabetes (just take my word on this one. There is more math involved, but there are two things in life I am really bad at…math and cooking. Therefore, a reference is provided at the end of this blog if you want to whip out your own slide rules). 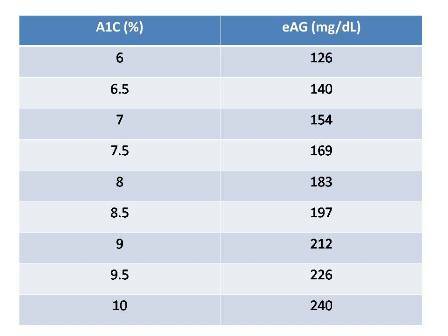 Table 1 lists the relationship between the A1C and the eAG. For those of you who want to do the math on your own, please, do NOT look at table 1. Get some black coffee, sit at a real comfortable chair, turn your iPod on to some AC/DC high volume rock and roll music and work these numbers out-long hand! OK, I’m going to make it easy for you. Try using the following formula: 28.7 X A1C – 46.7 = eAG. Now the moment you’ve all been waiting for, using A1C to diagnose Mr. Jones with diabetes. Mr. Jones is 450 lbs, 4 feet tall, 38 years old and his last admitted exercise session was a “nice, brisk sit.” You see 50 skin tags hanging off his neck along with dark areas of acanthosis nigricans. You preached diet and exercise at every visit since the Nixon Administration. Since then, Mr. Jones has gained 100 lbs. Now is the time you are going to prove to him that you were right all along. He DOES have diabetes. He should have listened to you and followed your prescription for lifestyle intervention. His fasting blood glucose level was 95 mg/dL (normal). Today Jonsey comes in 2 hours after eating at the International House of Pancakes. His 2-hour post-prandial glucose level is 165 mg/dl. Ah ha…impaired fasting glucose. So, let’s give him the A-bomb test right now…we’ll do the point of service A1C. Is this legal? NO! Keep reading. In the July 2009 edition of Diabetes Care, the International Expert Committee and the AmericanDiabetes Association published a position statement suggesting that an A1C of 6.5 % could be useful in some cases as a screening tool to diagnose diabetes. Observational studies have assessed glycemia with A1C and fasting glucose levels. These studies have consistently demonstrated a stronger correlation between the development of retinopathy and A1C and a less consistent relationship with fasting glucose levels. The cut point for diagnosing diabetes was set at > 6.5% because this is the level at which retinopathy is most likely to occur in these observational studies. In 1997, the International Expert Committee actually considered using the A1C as a diagnostic tool, but ultimately opted against doing so due to the lack of standardization of the A1C assay. By 2003 (the same year the Florida Marlins became major league baseball’s world champions), the Glycohemoglobin Standardization Program had succeeded in standardizing the majority of assays in the US. In fact, in 2009, between and within-subject coefficients of variation have been shown to be substantially LOWER for A1C than for plasma glucose measurements (which can be affected by heat, the duration of time the sample sits in the vial, and the type of media used in the collection tube). For you trivia buffs, the day-to-day and within person variability of A1C values NOW is < 2% compared with the 12-15% variability observed for fasting plasma glucose values! The A1C sample requires no preparation, can be performed fasting or non-fasting and is not heat sensitive. The fasting plasma glucose level (which is the preferred means by which the ADA suggests making a diagnosis of diabetes) must be performed after an 8 hour fast and is UNSTABLE at room temperature. Table 2 summarizes the reasons that A1C measurements are superior to fasting blood glucose levels when used to diagnose diabetes. But wait! Before you rush to judgment and advertise in your local paper that you are going to hold a “Diabetes Screening Day Using A New Fool Proof Method Of Detection,” let’s read the fine print. The A1C test can be used only in non-pregnant individuals. Some hemoglobinopathies (HbC, HbF and HbE) interfere with the A1C assay method, although some assays can actually identify these genetic hemoglobin abnormalities and provide a mathematical correction when present. A1C levels tend to increase naturally with age and can have racial disparities, although the exact extent of these interferences on the assay are uncertain (but they’re workin’ on this and should have an answer by the time the new health care legislation gets passed at which time we won’t be allowed to run the assay anyway)! Finally, in cases of rapidly evolving diabetes, the A1C may not have time to reflect the true severity of the illness. For example, an 18 year old patient may develop a viral illness on Friday night and be diagnosed on Sunday with Type 1 diabetes. His random blood glucose level would be 684 mg/dL, but the A1C would be 5.5%. 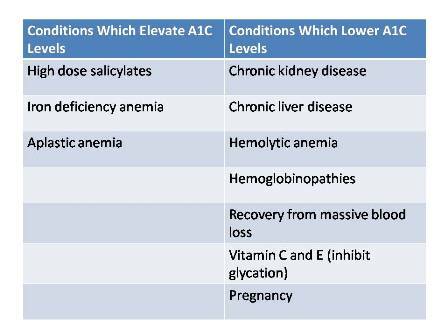 Table 3 lists conditions which can alter the reliability of A1C testing. 1. A1C testing for screening and diagnosing should be performed using laboratory assays only. Do not use point of care testing, which are less accurate. 2. The cut point for diagnosing diabetes in high risk patients is > 6.5%. 3. The diagnosis of diabetes should be confirmed with a repeat A1C test unless the patient is symptomatic or has a random plasma glucose level > 200 mg/dL. 4. Patients with A1C levels 6-6.4% should receive lifestyle intervention counseling and should be considered as being at higher risk for developing diabetes in the future. However, having A1C levels < 6% does not minimize one’s risk for the future development of diabetes. 1. American Diabetes Association. International Expert Committee Report on the role of the A1C assay in the diagnosis of diabetes. Diabetes Care. 3: 1327-1334. 2009.